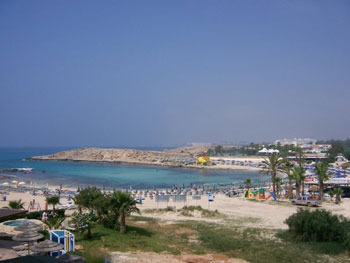 Ayia Napa holidays take you to the most popular destination in Cyprus. With a fantastic beach and a variety of recreational activities and tourist attractions, it has wide appeal. Add to this its vibrant nightlife, and you can see why cheap Ayia Napa holidays appeal to all ages. The advent of low cost package holidays has transformed the island with once sleepy fishing villages developing into popular tourist centres. Those with soft sandy beaches became the most sought after destinations, and Ayia Napa has one of the best beaches on the island. When is best to travel? The season is long and holidays can be taken from early spring to late autumn. It can be very hot at the height of the season with temperatures in the mid thirties. Those wishing to walk in the hills would be advised to avoid these times. The beaches of Ayia Napa have long stretches of sun-bleached sands sloping gently into warm, clear water, ideal for paddling and for weak swimmers. 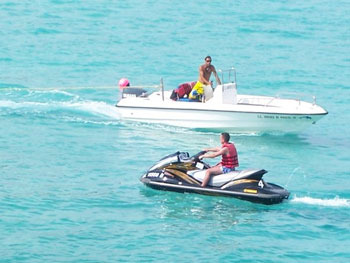 The more energetic visitor has a choice of water sports. Whether you are looking for total relaxation by the pool or on the beach, or participating in more strenuous activities on land or sea, a cheap Ayia Napa holiday will fit the bill. The resort caters for those who want to sunbathe by day and party through the night, as well as it does for those who wish to spend their evenings in a relaxed venue. Accommodation is good and service is excellent with locals doing all they can to make your stay a pleasant one. Electrical adapters can be left at home as the sockets are three pin like ours. The many restaurants cater for all tastes. Even if you are a fussy eater, do try the island's cuisine. With simple dishes perfectly cooked, they delight the palate. If this does not appeal, there are numerous restaurants which serve full English breakfasts, Sunday roasts, fish and chips and even your Friday night curry. With many regional airports flying direct to the island and with a flight time of a little over four hours followed by one hour transfers, getting to Ayia Napa has never been easier. If you wish to explore the island, car hire is recommended. The bonus there is that they drive on the left. If you want to travel to Ayia Napa but find the thought of trawling through web page after web page looking for the best deal a little daunting, try our simple search facility. You'll find over three dozen travel companies, including leading brands, competing for your custom. It is simple to use, and remember, competition brings out the best bargains. Our search facility enables you to see, at a glance, the Ayia Napa holiday that is the cheapest, and the one that offers the best value for money. It couldn't be easier. All you have to do to secure the holiday is make a phone call. As offers change daily, in order to avoid disappointment, you should ring today. 6 Top Mediterranean Beach Breaks - We've picked out our fave beach breaks to cheer ourselves up!. Top Five Waterparks in Europe – Book your Holiday Here! - Love huge slides and giant wave pools? Take a look at these five amazing waterparks and pick your favourite.